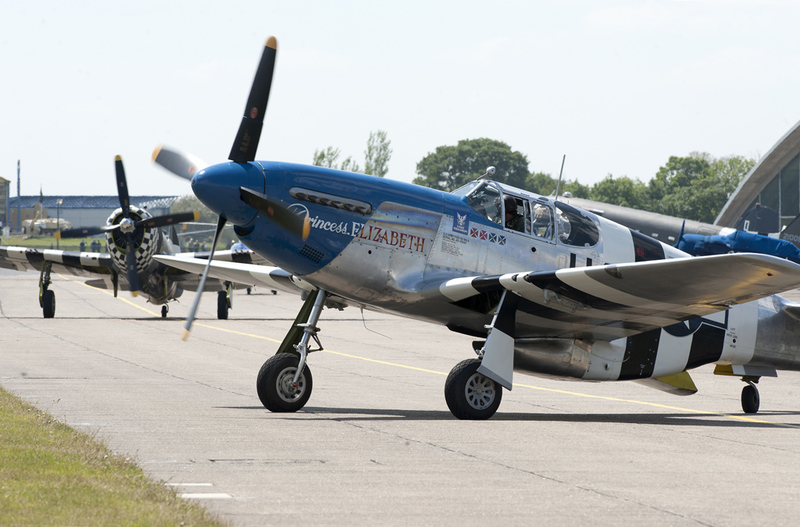 Monday 27th May saw the Eagle Squadron together with B-17 Flying Fortress Sally B and P-51 Mustang Miss Velma, carry out a commemorative flypast of American Second World War airfields to honour the American airmen who died whilst fighting for their country from British soil. 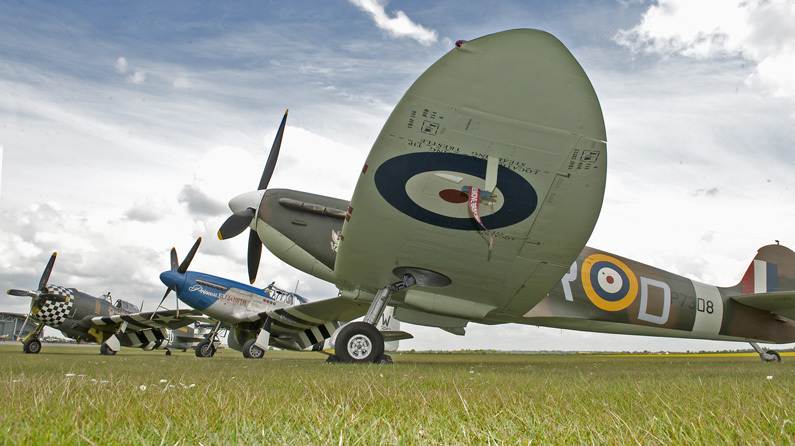 Words and Images from IWM Duxford. 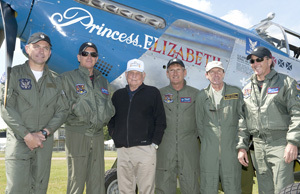 The Eagle Squadron’s historic Hawker Hurricane X, Supermarine Spitfire Mark I, Republic P-47G Thunderbolt and North American P-51C Mustang Princess Elizabeth flew alongside B-17G Flying Fortress Sally-B in a poignant commemoration of the legendary fighter and bomber aircraft flown by the United States Army Air Forces (USAAF) in England. B-17 Flying Fortress Sally B was the first aircraft to take off from IWM Duxford, followed by two-seater P-51 Mustang Miss Velma, carrying a very special passenger, United States Army Air Forces veteran Clarence ‘Bud’ Anderson. 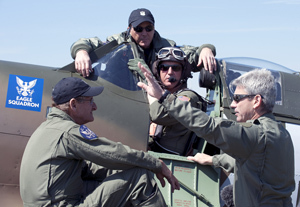 The Eagle Squadron then took off and moved into formation with B-17 Sally B and P-51 Mustang Miss Velma. From IWM Duxford, the Eagle Squadron formation’s first destination was Bassingbourn Barracks, which was home to the USAAF 91st Bomb Group from August 1942 to June 1945. The 91st Bomb Group flew B-17 Flying Fortresses, the most famous of which was the Memphis Belle. On leaving Bassingbourn, the Eagle Squadron flew over Cambridge American Cemetery at Madingley, where a memorial ceremony was being held. 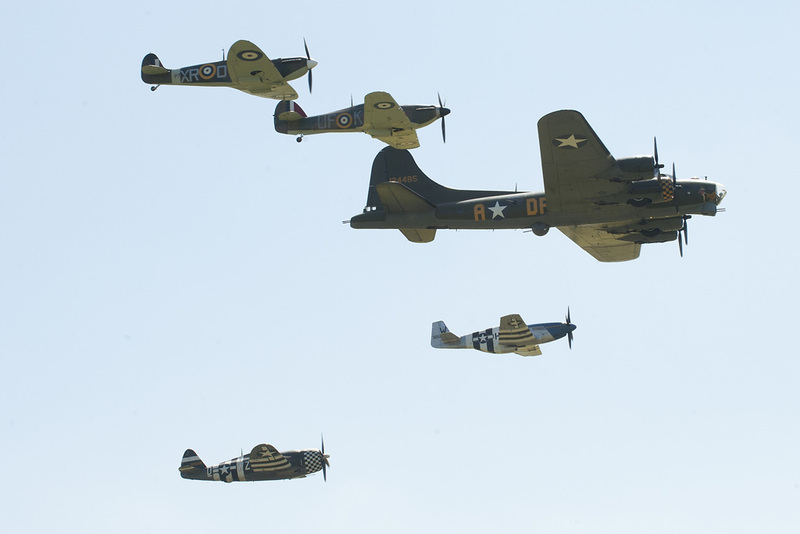 The formation then continued to RAF Mildenhall, home to the modern-day United States Air Force in Europe, and from there to Bodney airfield, which was home to the 352nd Fighter Group from May 1943 until V E Day. From Bodney, the aircraft continued to RAF Snetterton Heath, which was used by the 8th Air Force 96th Bombardment Group from June 1943 until its deactivation in December 1945. The next destination was RAF Horham, which was handed over to the 13th Combat Bombardment Wing of the 3rd Bomb Division in 1942. Horham was mostly home to the 95th Bombardment Group (Heavy) which flew B-17 Flying Fortresses in bombing campaigns until V E Day. From Horham, the Eagle Squadron overflew RAF Thorpe Abbots, which was originally built as a satellite station to RAF Horham. The commemorative flight then continued to RAF Halesworth, which was home to the 56th Fighter Group, flying P-47 Thunderbolts, and then to the 489th Bombardment Group (Heavy), flying B-24 Liberators. From Halesworth, the Eagle Squadron made its way to RAF Leiston. This was an emotive experience for veteran Bud Anderson, as he flew his P-51 Mustang Old Crow with the 357th Fighter Group from this airfield. 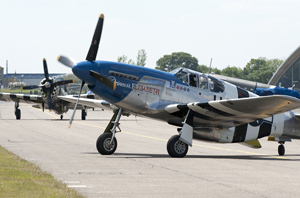 At this point, P-51 Mustang Miss Velma, carrying Bud Anderson, peeled away from the formation for a reminiscent return to RAF Leiston. The Eagle Squadron’s final destination before returning to IWM Duxford was RAF Debden. This airfield was home to RAF Eagle Squadrons which were later formed into the 4th Fighter Group when the USAAF took over the airfield. It was a poignant and historic commemoration to the American airmen who lost their lives fighting for freedom from British shores.